I'm also happy to say I accomplished all of my goals for last month! All titles below are linked to my reviews/thoughts. I read The Hunger Games and had mixed feelings about it. I read Think, by John Piper and found much to appreciate about it. I completed reading my first ever Gilbert Morris book - The Crossing - and have a review of that forthcoming (with accompanying giveaway.) So you can stay tuned for that if you like. Now, what's up for this month? My friend Sky agreed to read A Tale of Two Cities alongside me, so it's my mission to make it through this classic work during the month of March. I would like to make it abundantly clear that I am reading this because my husband really liked it and NOT because Oprah picked it for her bookclub reading. (My timing is terrible!) I'm also reading it because Sky said she'd read it with me (for moral support?) I don't like Dickens. So we'll see how this goes. In Japan the Crickets Cry : How Could Steve Metcalf Forgive the Japanese? which looks like a fascinating tale. This one is a review copy so I really DO need to get to it and likely will. Beyond that, I'd best make no promises. Although I do have a little stack here . 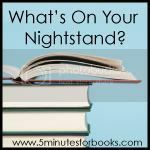 . .
Off to see what is on everyone else's nightstands this month! I've got so many "to-read" books now, it's going to be a while before I get them read! I'm doing a fun little book meme over at my blog. It has to do with what authors you have in your library. It's really quick, and a good way to spread some link love. Hope you'll check it out! A Tale of Two Cities? You are brave, Carrie. I managed to read Great Expectations for required reading the summer before 7th grade. Two Cities was also required but I just couldn't get past the first page. But it must have some redeeming qualities if your husband likes it! Can't wait to read your thoughts on it. I am currently reading Slave by John MacArthur and Jane of Lantern Hill by You-Know-Who! Jane is SO good---I'm sorry it is a single title and not a series. I can't wait to hear what you think of Gilbert Morris. I read him as a pre-teen and am now dreading the thought of re-reading in order to "read every book" in my library. However, I wonder how much of my dread has to do with him as an author and how much has to do with the time of life I was in when I first read him. 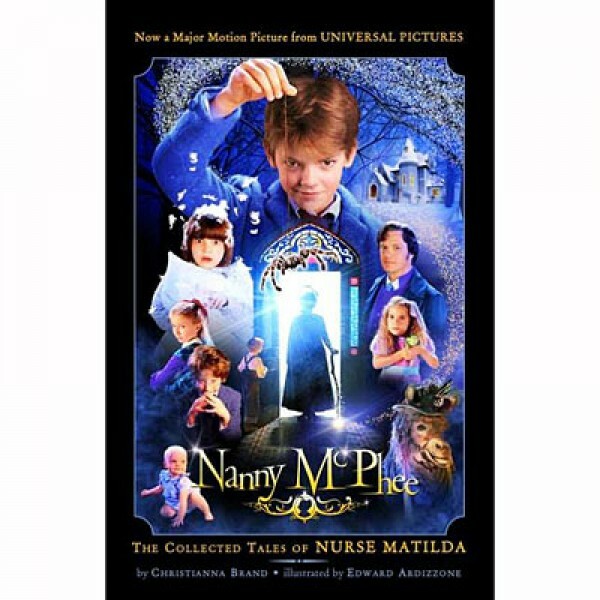 I read those three Nurse Matilda books (Sorry, I don't know if those are all there are), and enjoyed the first, but not so much the two following. It was a little like chick-lit--you expect the characters to have learned something from the first book and then they go and forget it all in time for the second. Congratulations on meeting all your goals! I'll be interested to know what you think of Morris. I read him years ago and can't remember much except that his tales were engaging, but there were a couple of bawdy elements in the ones I read which I thought was strange. I can't remember which books they are but they were in a long series. I might join you in Tale of Two Cities in March -- I wanted to read it this year. It took me several tries at different times to get through it, but once I did I loved it and immediately reread it to pick up on foreshadowing that I had missed the first time. BTW, do you know what happened to the Classics Book Challenge someone was going to do? I found the link where I mentioned it on my blog but the link didn't go to a post any more. I looked around the person's blog but there seemed to be no mention of it -- left a comment but haven't heard back. I love A Tale of Two Cities! I mentioned to my husband that you were going to read Tale of Two Cities. He wanted me to tell you that when he read it, the book had two strikes against it. 1 - It's Dickens. 2 - It was required reading for a high school English class. However! He thoroughly enjoyed it. He said that even though he's had to read several Dickens books, Tale of Two Cities was the only one he actually enjoyed. Hopefully you enjoy it as well! 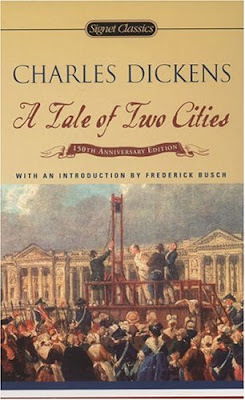 I've been thinking about reading A Tale of Two Cities this year or one of Dickens' other works. So far I think A Christmas Carol is the only work of his I've read! I predict that the first line of the book will summarize your experience with it: "It was the best of times, it was the worst of times..."
Caniad - I speculate you will be right. Barbara H. - No. I'm actually NOT sure. I'll look into that too and e-mail you if I find something out. E-mail me if you find out! Well, you know I loved Two Cities when I read it last year (was it last year? ), but then again, I like Dickens fairly well. Count me in as another used-to-be fan of Gilbert Morris. I might possibly still be a fan--I don't know, since I haven't read anything by him in years. I used to collect the House of Winslow books, but I finaly PaperbackSwapped 'em. Gotta run and make some lunch! So maybe I shouldn’t feel so compelled to read The Hunger Games after all…. I finally watched the Duggars t.v. show last week for the first time and was really impressed with them, so I’d probably like the book too. I listened to A Tale of Two Cities a few years back and found it intriguing, although a bit long. Hope you enjoy the reading of it! I had missed your Hunger Games review (thoughts? rant?) so I'm glad you linked to it. As I think I told you, I am not surprised you didn't like it. The 3rd book in particular does go into the horrors of it all, and it's obvious she's making some sort of political statement, though I'm not sure what it is :) I liked them, but I totally understand anyone who chooses to avoid them, and before recommending them to any adult or teen, I make sure that they know the nature of the subject matter. As for Tale of Two Cities -- I didn't know that Oprah recommended it, but if I was reading it, I'd have to be sure people knew why too!!! I read A Tale of Two Cities a couple of years ago and loved it. It is the only Charles Dickens book I've read so far, which reminds me that I have two others of his sitting on my shelf yet to be read! I'm reading the Duggars' book also - I really like them and feel kind of sad when I see them 'dissed' online. In fact, I'm making tater tot casserole this week from their book :) I loved that you had seen a documentary on Eva Kor (Auschwitz) - was it on TV? Having read the book, I'd love to see her as well. I enjoyed the Hunger Games and thought the Duggers book looks good but not sure if I will read it. I have A Tale of Two Cities by my bed but have not begun it yet! I read A Tale of Two Cities for high school English and remember having a devil of a time getting through it. I should read it again to see if it's any easier as an adult. I meant to say that I'm really interested in that Japan book, especially since reading Unbroken (which you absolutely must read). I am going to have to look into the Duggar's book. 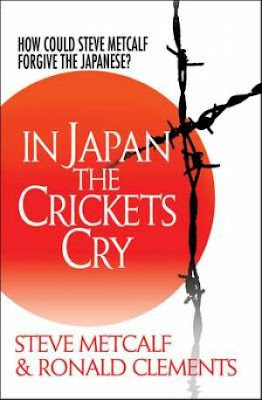 The Japan book looks like an interesting read. Quite the list here! I appreciate your review of The Hunger Games, although I don't think I will be picking that one up. It's probably good not to commit to too much. I've already got some books that have been on the "nightstand" for a couple of months and I'm still not sure if I'll get to them anytime soon.